Inspiration can strike unexpectedly, suddenly – at any moment. Be prepared. If you have created your perfect fave highlighter color and mixed up an ample amount, then nothing can stand in the way of your experimenting happily with textures and creating any kind of highlighter/concealer product you can imagine. Here's a peek at a couple of make-up items I did last year alongside a brand new, completely-unexpected-because-I-was-suddenly-inspired one. You happen across a recipe for a cream concealer that looks intriguing. Because you already have your fave pre-mixed color on hand, you are using your new, perfectly color matched make-up product within the hour (and strutting about like a proud peacock because you are so savvy). 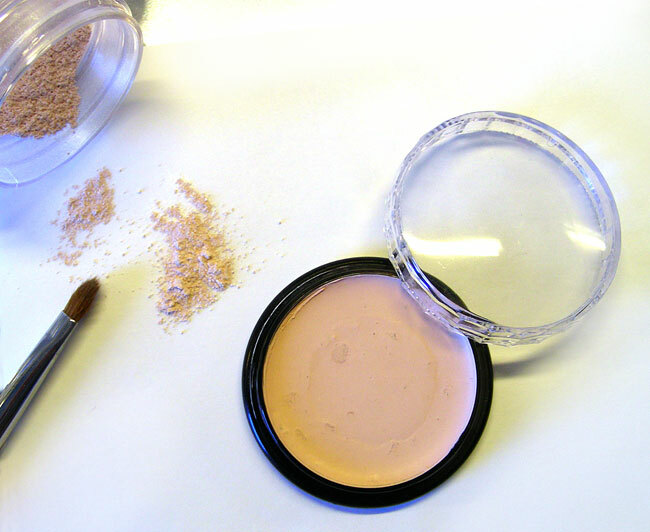 Here's what happened when I happened across a recipe for a cream concealer the other day (link to recipe below). I couldn't help it. I was inspired. 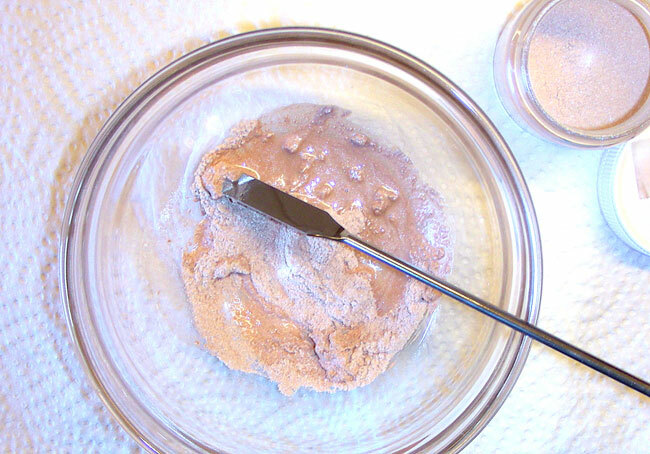 For powdered make-up, the addition of a base powder mix is necessary. Base powder will give your pigments the ability to stay where they are applied (a great asset for things like loose or pressed powder eye shadow and foundation). Base powder can be made up of different powder types, but will often include cosmetic-grade talcum, magnesium stearate, cornstarch, titanium oxide, zinc oxide, clay, etc. 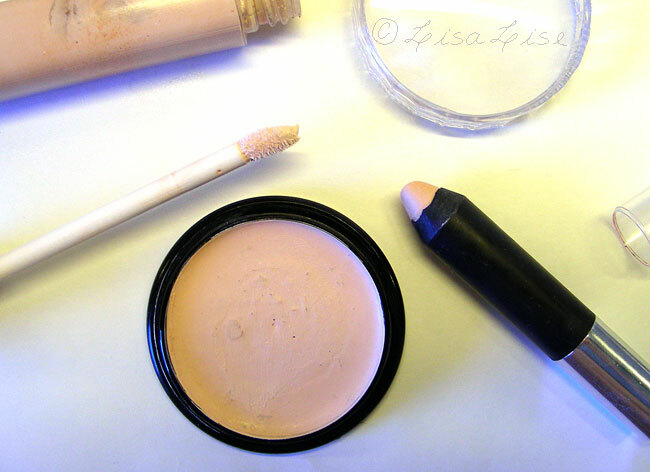 Below: a bit of my fave premixed highlighter color (pigments only) next to the finished cream concealer. See the uneven surface of the concealer? That's due to me not being fast enough pouring the mix into the container. I had to remelt to get it all out of the beaker. 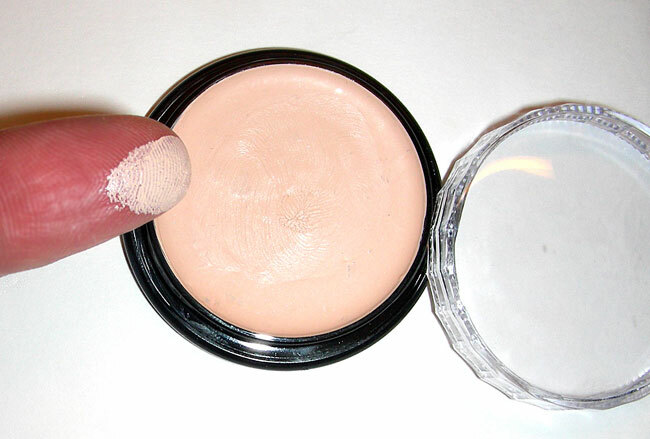 Below: This concealer really functions well with great coverage and fabulous staying power. I started by applying it with my finger, but quickly discovered that it goes on beautifully with a brush. I've already purchased a dedicated brush for it. Love! The only change I would recommend to Aroma Zone's 'Corrective Concealer' recipe is to pre-mix ALL your pigments before adding them to the oils. Bonus tip: after you have melted the fats and beeswax, work quickly so you don't have to remelt. How can I see the recipe for Concealer in English on Aroma Zone? Hi Anita, You'll need to view the site through Google translate. That's what I did. It's not a perfect translation, but good enough. Thanks for your suggestion of using Google Translate. I tried that, but I don't know what Caprylis or Coco Silicone are? Maybe it did not translate well? Is that what they are called in English? Maybe you substituted something else for them. I'd really appreciate it if you could let me know. Coco Silicone is the name this company has given this product. The INCI name for it is coco-caprylate. It is a coconut-based product. Hope this helps! 1) Now I am trying to figure out what is meant by some of the measurements. I know that cuillères means spoon. But I don't know what they are referring to by "TAD", "DROP" or "DASH". I'm not sure if they are referring to a teaspoon or a tablespoon with the measurements. I did a Google search on it and I could not figure it out. Perhaps you know what the measurements on the website are saying in English? 2) I have very fair skin. What do you suggest when mixing this up to try and keep it fair colored? Hey there Anita- The TAD DROP and DASH are measurements that apply directly to the micro-measuring spoons you can order from the same site. I ordered these and am really pleased with them - I use them for my own color mixing. It can be much easier to use micro-measuring spoons than a weight for very small amounts. As to keeping the color fair: your base white is going to be your best friend for keeping the color light as possible. If you want opaque color (non-see-through- with good coverage), titanium dioxide is ideal for this. (the only dangers with titanium dioxide is inhaling it in large amounts, so if you've read warnings about it, it is on the safety data sheets regarding handling of the material in large amounts). If you are looking for a sheerer color, mix your titanium dioxide with silk white. Do drop a comment again if you have any more questions. Best of luck with it! Also, is there any substitution for the titanium dioxide if you really don't want to use this? Maybe zinc oxide, arrowroot powder, kaolin clay....anything??? I want to make my own, so I don't have to use TD. Thanks! Hi Anon - you can substitute T-dioxide with zinc oxide if you prefer. It is the T-dioxide that is going to give you the best coverage. If you're worried about absorption, use 'non-nano' t-dioxide. As to translating the recipe, haven't you tried going through google translate? That kind of does the whole job for you. I use the metric measuring system in my recipes, but if you prefer measurements in ounces, try typing 'convert X grams to oz' in google and it will convert for you in a flash. Your suggestion of doing a full on translation is a good one and I may revisit this and do new blog post on it at one point. Thanks for your input! I LOVE your blog! It is a hidden treasure that is so hard to find! I searched for weeks and weeks on this topic, and it is a miracle you came up in a chain of links. Great page sweetie, thank you! Can someone please send me the link for the recipe? I cannot find it when i click on the link given. Thanks! Is your highlighter based on the Touch Eclate(sp)? Highlighter/ bronzer Duo? That stuff is supposed to be like the icing on the cake!! !SO PRETTY AND SHEER.......but SO COSTLY TOO!!! lol Your brush post reminded me of that Brand........eeek, so excited if so. Lol but even if not, the powder above SURE looks close enough! You did good! Thank you for being SO SO KIND to share with us.